Washington, DC. JAVA is working closely with the Center for Military History (CMH) and the Army Historical Foundation on exhibits that will relate the history of the Nisei experience during World War II. 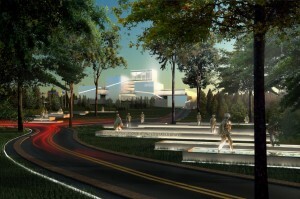 The exhibits will be displayed at the National Museum of the United States Army that is scheduled to open in June 2015. Over 40 acres of land will house the museum on Fort Belvoir, Virginia, about 20 miles south of Washington, DC. It will be the pre-eminent museum for the United States Army. CMH plans to include a permanent exhibit honoring the 100th Infantry Battalion and 442nd Regimental Combat Team but does not have any artifacts in its holdings for the permanent exhibit. The Center has asked for JAVA’s help to obtain artifacts from the 100th Infantry Battalion and 442nd Regimental Combat Team from the World War II era. Artifacts include items such as clothing, insignia, subsistence items, equipment, documents (other than photographs, posters, and motion pictures), artwork, and any other item that can be associated with either military unit or a member of either unit. Donations are preferred as there are strict rules regarding loans of artifacts. Since loans are limited to only 5 years, the Center may not accept a loan given the investment that is needed to preserve the loaned artifacts. Artifacts that are accepted for donation will greatly assist in commemorating the dedication and courage of those that served in the 442nd RCT. Your donations will go a long way to ensure their recognition. JAVA will work with CMH to see if your donation is acceptable. A photograph or description of your proposed donation would be useful. If the artifact is suitable, the Center and donor will enter into a Gift Agreement. The agreement is attached to this news release. With respect to the National Museum of the US Army, JAVA has has been informed by the Center that there will be permanent displays of the 24 Americans of Japanese Ancestry who have won the Medal of Honor (21 from World War II, one from Korea, and two from Vietnam). In addition, the Army and Society Gallery will have an exhibit telling of the Nisei experience during World War II; a commemorative brick for the 100th/442nd and Military Intelligence Service will be placed on the walkway to the Museum entrance; and individual Soldier stories will be featured on a temporary basis in the Soldiers Gallery. If you have an artifact that you want to donate for the 100th/442nd permanent exhibit, contact Gerald Yamada, JAVA President, 10316 Mountington Court, Vienna, VA 22182; gyamada@goingforwardstrategies; (703) 938-3074.